As I said yesterday, I've become slightly polish obsessed (think: birthday presents). So today's links of love will touch on some of the nail art trends with which I have recently become familiar. I discovered water marbling for nails just a couple months ago and still haven't been able to figure out the technique solo. For those of you who don't know, water marbling is a method of painting your nails in which you form the design on the surface of a cup of water using a toothpick or some other tool. After preparing your fingers with tape gloves, the victim rolls their nail through the design. Upon completion, tape gloves are removed and then you have a long, tedious date with your nail polish remover to take off any stray marbling. The newest, hottest, most Kim Kardashian thing in nails right now--caviar nails. Personally, I think they look tacky, but then again, I've never seen them in person. This manicure consists of painting your nails (preferably with a matching polish/bead combo, but clear coat supposedly works, too) and then pressing/pouring beads onto the still-wet mani. I like the striped/ombre effect here on the pink nails, but the texture still really bothers me. 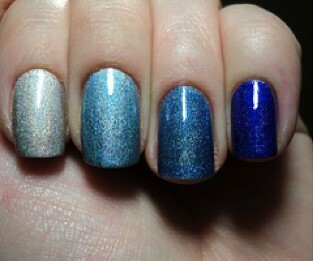 Speaking of ombre effects, ombre nails and nail polish sets are popping up all over the place. Some of you may not know, but the term "ombre" is a dying effect, generally used on fabric, where the color creates a gradation. I consider this mani to be a sort of ombre cheat because we all know it should really look like this, but this effect is much hard to achieve at home. Did these wacky and far-out manicures inspire any nail art for you? Post photos please!